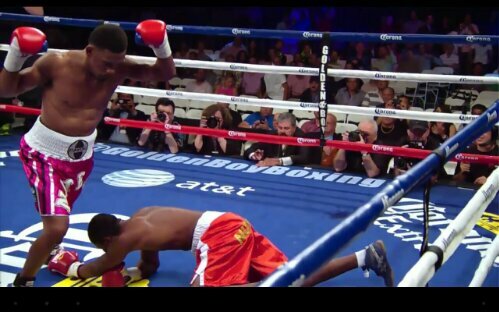 Earlier tonight on Showtime Extreme, Danny Jacobs scored three knockdowns in an easy destruction of Milton Nunez. Jaocbs scored his first knockdown off a sweeping left hook. The second came off a looping right hand, and the finale via another left hook. Jacobs has spent the last year rebuilding his career after overcoming cancer, and looks primed to possibly challenge fellow Golden Boy fighter Peter Quillin for the WBO middleweight title. With both guys having good power and a propensity to exchange, Jacobs-Quillin could be an action-packed, and probably short, battle.